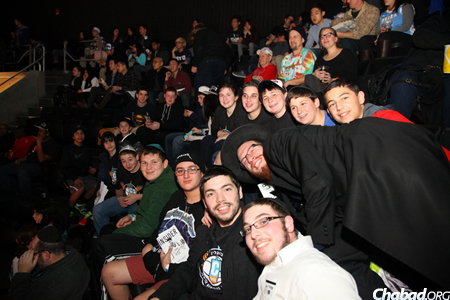 Jubilant faces are a rare sight after a disappointing loss by the home team, yet it was all smiles for the thousands of Jews who participated Tuesday night in CTeen’s Jewish Heritage Night at the Brooklyn Nets game, held at the new Barclays Center in Brooklyn, N.Y. 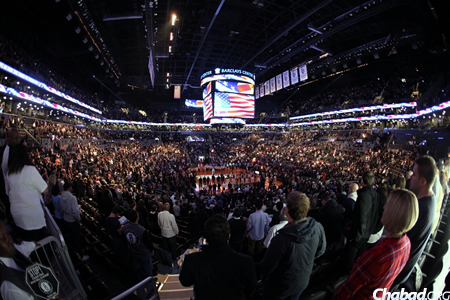 The Nets lost to the Denver Nuggets by a score of 111-87. 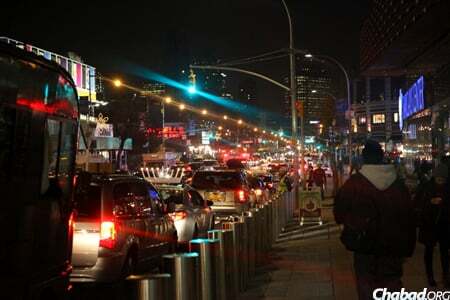 Nevertheless, some 19,000 spectators rode home not just chatting about the usual three-pointers and game passes, but of Chanukah and Jewish pride—the spotlight of the sold-out game. In fact, the loudest standing ovations of the night were awarded to Benny Friedman for his stellar national anthem rendition, as well as to the popular Maccabeats choral group of Yeshivah University for their halftime Chanukah performance. Visible from every corner of the stadium and captured on the giant screens during every foul shot was the first-ever basketball menorah, lit by Elias Rosner, a CTeen member from Woodcliff Lake, N.J. The menorah’s light not only brightened the stadium, but was visible to the millions of fans who watched the game via the YES Network. The menorah-lighting ceremony was replayed during halftime as well. Signaling the beginning of the game, Chanukah messages were delivered by local shaliach Rabbi Shimon Hecht and CTeen leader Maddie Rosen from Teaneck, N.J. Event sponsors included The Jewish Press, Basil Pizza and Wine Bar, Great Kosher Restaurants,The Jewish Week, Osem foods, Jdeal, Kosher Kouponz, Farkash Financial and Zev Brenner of TCN, The Comcast Network. “Teens love sports. We want our teens to understand that being a sports fan, celebrating Chanukah and being proud of your Jewish heritage can all go hand in hand,” says Rabbi Mendy Kotlarsky, director of CTeen’s executive committee. The CTeen Network was inspired by the Lubavitcher Rebbe—Rabbi Menachem M. Schneerson, of righteous memory—whose belief in the power of youth transformed the teen years into a time of purpose and self-discovery. CTeen harnesses the incredible potential of teenagers with programs that bring teens together to give back to their communities. For most of the young people from the 34 CTeen chapters participating in the event, Torah and mitzvot are rituals they reserve mainly for the synagogue and home.